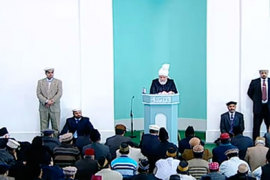 Today, Huzur delivered his Friday Sermon on the extremely perilous state of world affairs, and how Istighfar (seeking forgiveness from Allah) and giving Sadaqah (financial sacrifice/alms) can help avert Divine punishments and catastrophe. Huzur said that today anti-Islamic forces are laying the blame on Islam for the disorder and strife prevalent in the world. Of course it is true that some so-called Muslim groups are perpetrating absolute atrocities in both the Muslim and non-Muslim world. However it is also true that there has been a deliberate ploy to create such a predicament amongst Muslims. Indeed, certain self-serving Muslims are the most to blame for causing harm to the name of Islam. Generally people in the world also count Ahmadi Muslims amongst the overall population of Muslims and thus Ahmadis are also targeted for criticisms, whereas those familiar with the Ahmadiyya Muslim Community know we only promote peace and love. However many attribute the same perception to us as the image they see being painted in the media regarding Muslims in general. Further, Nationalist parties across Europe are gaining strength who do not want to listen to reason, and the state of affairs in the USA is also evident to everyone. As Ahmadis we have to face hardships on two fronts: as Muslims living in the West, and as Ahmadis in Muslim countries where we are oppressed for being Ahmadis. In Pakistan we are persecuted under a cruel law which gives free license to the Muslim clergy against us. However now in Algeria similar circumstances have arisen and the justice system there has mirrored that of Pakistan. At least 16 innocent Ahmadis have been imprisoned in Algeria on baseless accusations. So what should an Ahmadi so in all of this? We need to give great emphasis to worship, Istighfar (seeking forgiveness from Allah) and to Sadaqah (financial sacrifice/giving alms). This is the way to come into the refuge of Allah the Almighty and stir his mercy. Huzur said that in previous sermons he has expounded on prayer and worship – whilst today he would focus on Sadaqah (giving alms) and on Istighfar (seeking forgiveness from Allah). The Promised Messiah (as) has explained that “Sadaqah” is derived from “Sidq” which means that one who gives alms in the way of Allah displays a relationship of “Sidq” (truthfulness and sincerity) with Him. Secondly the Promised Messiah (as) says is prayer, which should create hurt-burning passion and depth of feeling within one. Huzur says, thus Istighfar is also a type of Prayer. When engaging in Istighfar it should be done with agony and passion in one’s heart. Just saying “Astaghfirullah, Astaghfirullah” superficially or paying lip service to it whilst not even really focusing on God when saying it, will not benefit you at all, unless it is done with heart-felt zeal and truly with your weaknesses in view. What happens when a person gives Sadaqah (financial sacrifice) in the way of Allah purely to attain His mercy and also pledges to strive to his utmost to avoid transgressing. This has been conveyed by Allah the Almighty through the Holy Prophet (sa) who informed us that God said: Tell my servants that when they advance one step towards me, I move two steps towards them. And when they walk rapidly towards me, I rush towards them. Thus the mercy of God is infinite and boundless. Allah the Almighty never leaves man empty-handed and without reward or blessings, when man spreads his hands out to Him begging for something. However it is not always the case the man’s prayers are accept exactly in the way he had wished. Sometimes God answers man’s prayers immediately, or sometimes Divine wisdom dictates that his prayers are answered later or in some other way. In any case we need to maintain the perfect belief in what Allah the Almighty has said that He accepts our prayers, accepts our Istighfar (seeking forgiveness from Him) and our Sadaqah (giving alms). We should always remember that Allah knows the state of our hearts. Actions done for show are not accepted, only actions done sincerely are. Allah the Almighty never leaves good actions without rewards. God is so kind that as the Holy Prophet (sa) has explained, if one is poor and cannot give alms, then for such a person performing good deeds and forbidding bad deeds will give him equal reward to giving alms. Thus, one should be extremely grateful to Allah the Almighty, Who has not only taught us the methods by which we can safeguard ourselves from our shortcomings, but He also accepts our meagre efforts and protects us from future difficulties and trials. The only way we can escape difficulties is by prostrating before Allah the Almighty with complete devotion and sincerity of the heart. We must also pay special attention towards Istighfar [seeking forgiveness] and Sadaqah [alms]. The Promised Messiah (as) states that sin is like a vermin which is subsumed into man’s blood and its only form of cure is Istighfar. What is Istighfar? It is to seek forgiveness for the sins that have already been committed and also to seek protection from committing any sins in the future. People of all faiths believe that Sadaqah (charity/alms) can avert divine punishment, but this is only possible when this is done before the actual punishment befalls a person, however once the divine punishment comes into motion then there is nothing that can be done to forfend it. Thus, one should constantly remain occupied in Istighfar. Further expounding on the subject of Istighfar, the Promised Messiah (as) states that in the Holy Quran, Allah the Almighty has been called Al-Haye [the Living] and Al-Qayum [the Self-Subsisting and All-Sustaining]. His attribute of Al-Haye demands that we worship Him and Al-Qayum demands that we should seek Him for help and also the strength to refrain from committing sin. Thus, true Istighfar is to seek strength so that one does not commit any sin but it has been further expanded to include even those who have already committed sin so that they remain safeguarded from its pernicious consequences. Man has been created for a very noble purpose and that is to attain the nearness of Allah the Almighty through His worship. However, when one does not fulfil this purpose then Allah the Almighty brings him to an end. Therefore, one should profusely recite Istighfar so that Allah the Almighty continues to show His grace. The Promised Messiah also states that prayer is a means of acquiring great accomplishments. It was the fervent prayers that saved the people of Prophet Yunus (as) [Jonah] from the divine punishment. When the punishment was averted, Prophet Yunus (as) felt as if his prayers and the prophecy he had made went in vain. However, an important lesson is to be learnt from this which is that intensely emotional and fervent prayers and Sadaqah can change the course of destiny. It is from this that we derive the concept of offering alms, and this act pleases Allah the Almighty greatly. In the book, Ilm-ul-Tabir-ul-Roya [the discipline of the interpretation of dreams], the liver symbolises wealth therefore meaning that to offer Sadaqah is akin to offering one’s life. The fact is that the mere use of speech is of no avail unless one also show a practical demonstration along with it. Addressing two members of the Jama’at (Ahmadiyya Community) who had just performed the Bai’at at his hands, the Promised Messiah (as) said that they should frequently counsel the members of their household to perform good deeds. Just as a tree or field does not bear its fruits if sufficient water is not provided, in the same way if the heart is not given the water of virtue and piety, it is of no use. Such advice should always be given as it will enable them to remain focused on prayers and offering Istighfar. In order to attain the blessings of God Almighty, one not only needs to adhere to the prescribed worship, but at the same time one must abstain from all sorts of injustices. The Promised Messiah (as) stated that it is a common teaching across all religions that giving alms and charity can avert a trial or chastisement that God had already decreed. 124,000 prophets all agree upon this fact. The Holy Prophet (sa) once stated that giving alms can avert God’s wrath. On another occasion the Holy Prophet (sa) stated that one should save oneself from the fire by giving alms, even if it is through giving half a date. Huzur (aba) then stated that we should always remember the points mentioned earlier as well as recite Istighfar [seeing forgiveness from Allah] constantly. Istighfar helps to prevent one from committing sins in the future and invites the mercy of God. The Promised Messiah (as) stated that a vice committed out of negligence is worse than that vice which is supplemented with remorse. If one truly repents for their previous sins and vows to abstain from them in the future, then it is as if they never sinned at all. If an individual out of negligence does not even know that he or she is committing a sin, then this is a dangerous trait. Therefore one must eschew negligence and everyone should have full knowledge of their actions. May Allah the Almighty enable us to understand the truth behind this matter and enable us to prostrate before him with full sincerity. May Allah the Almighty always safeguard us from every enemy attack and revert the plans of the enemy back onto them. Huzur said that after the prayers he would lead the funeral prayer in abstentia of Mrs Sa’da Bartavi Sahiba, who was the wife of Murree Bartavi Sahib. She suffered severe burns due to a gas leak. When she was taken to the hospital her health improved significantly. However four days later she suffered a heart attack and as a result she passed away on 10th January 2017. To Allah we belong and to Him we shall return. She accepted Ahmadiyyat after her husband in 2004, but in terms of loyalty and sincerity she was more devoted than her husband and children. Her husband, Murree Sahib stated that soon after she accepted Ahmadiyyat she fell pregnant. One day she fell down the stairs and there was a risk that she may suffer a miscarriage. During the night in a dream she heard a voice from the heavens which stated: ‘Fear not! Allah will protect this embryo.” After this experience they decided that if they were blessed with a boy they would name him Ahmad. Thus is was as so and they named the baby boy Ahmad. Similarly she saw another dream in which a voice from the heavens resounded that ‘Allah will safeguard this child’. One day she was walking on the side of the motorway with her son. He let go of his mothers hand and began to cross the motorway. She held her head and shut her eyes. To her amazement when she opened her eyes her son had safely crossed the motorway and stood on the other. Her son in law, Musab She’eri Sahib, who lives in Germany stated that she was a very pious natured and simple lady, who would never quarrel with anyone. Her husband was arrested in 2009 and up until 2013 she looked after her children to the best of her ability. She had to work in order to raise her children and pay off their debt. She is buried in the Hosharb region of Damascus. May Allah the Almighty have mercy on her and enable her children to remain firmly attached to Khilafat.